Washington Kiwanis Club President Wanda Coil, standing, talks with dinner guests, from left, Mary Sue Spengler, Carol Dilley and Russ Dilley, all of Washington Court House. They were enjoying dinner during the annual Kiwanis Soup Supper held Saturday afternoon at the Senior Citizens Center. Guests were served three types of home-made soup, cornbread, cold slaw and a variety of home-made desserts. https://www.recordherald.com/wp-content/uploads/sites/27/2017/03/web1_kiwanis-1.jpegWashington Kiwanis Club President Wanda Coil, standing, talks with dinner guests, from left, Mary Sue Spengler, Carol Dilley and Russ Dilley, all of Washington Court House. 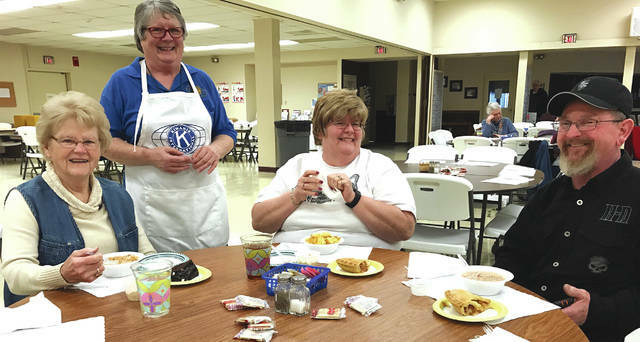 They were enjoying dinner during the annual Kiwanis Soup Supper held Saturday afternoon at the Senior Citizens Center. Guests were served three types of home-made soup, cornbread, cold slaw and a variety of home-made desserts.